Readers, due to the madness of the festive season, it’s been near enough impossible to find the time to blog. But I’ve been spreading Christmas cheer recently… making festive gifts for the office. I started my first batch of festive cupcakes using a standard vanilla sponge (can’t go wrong, recipe below) and then varying the toppings. I made a series of red buttercream frosting cakes first and finished them with home-made chocolate reindeer. 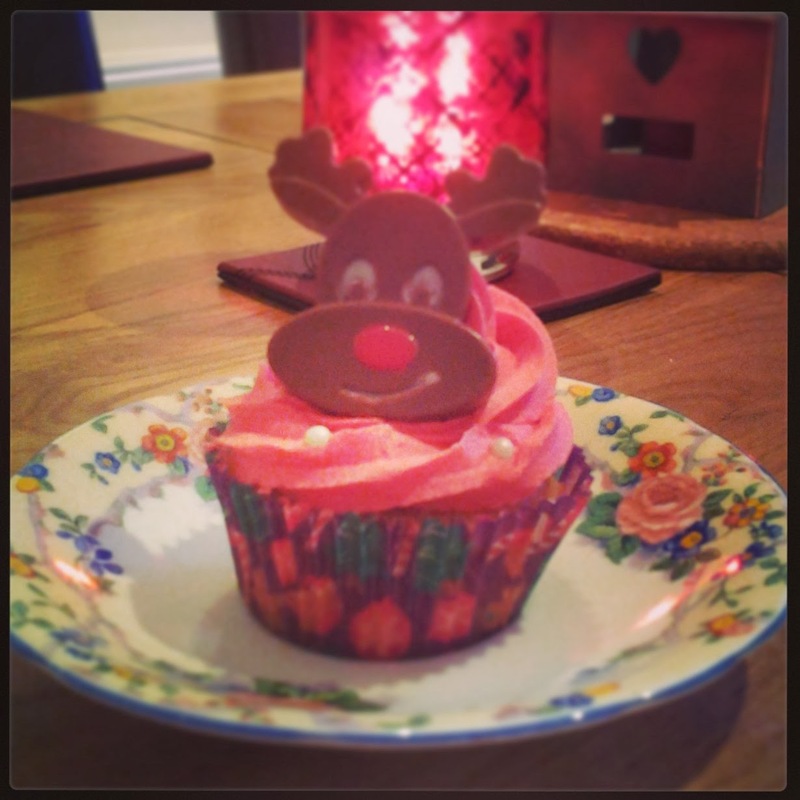 The reindeer were really easy to make using two colours of Wilton Candy Melts and milk chocolate. Firstly, I laid down the coloured candies using a fine paint brush to mark out the eyes and mouth. I then let the colours set in the fridge, before pouring in the melted chocolate and letting the reindeers fully set in the fridge for several hours. 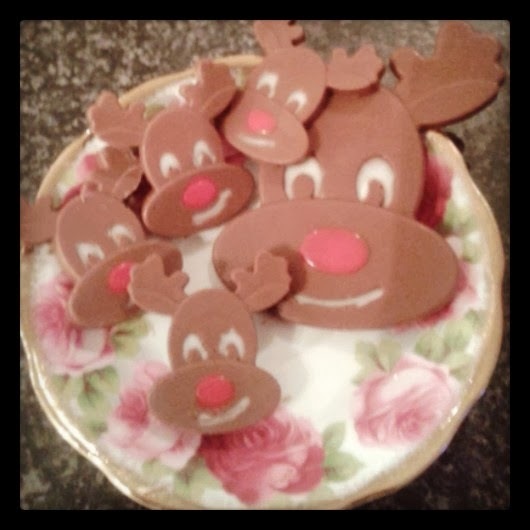 I used a silicone mould purchased at the BBC Good Food Show in Birmingham last month. The reindeer shapes then popped out of the mould really easily. They were a great talking point at our group Christmas Jumper Dinner! 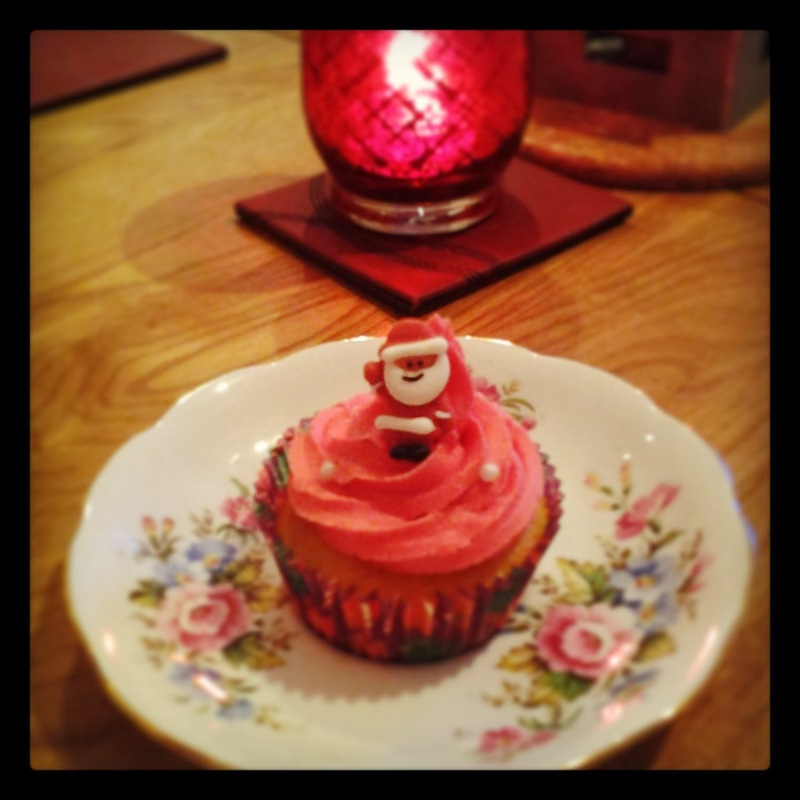 Here comes Santa Claus... on a vintage saucer. 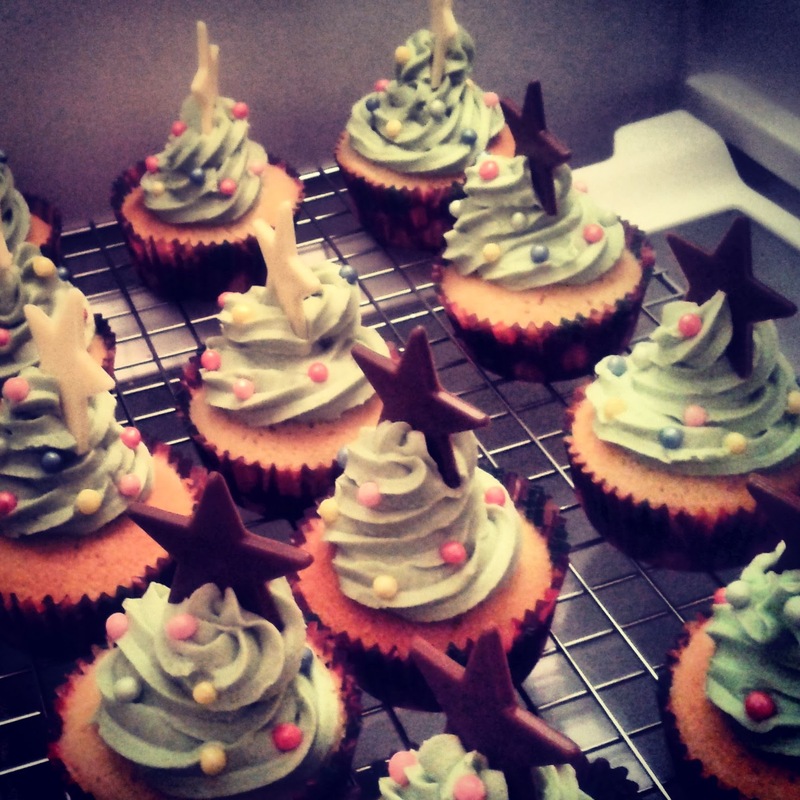 The second batch of Christmas cupcakes was produced for my colleagues. 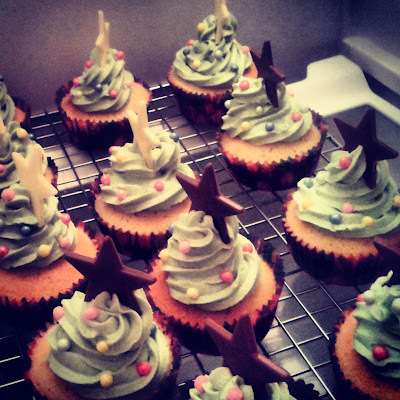 This time I went all out making Christmas trees. These were a bit of a challenge and I have to admit that some of my trees were more alpine like than others, but overall, they went down a treat. I piped each one in green. The biggest challenge was trying to bring the colour up… no matter how much colouring I used; they remained more mint green than tree green. 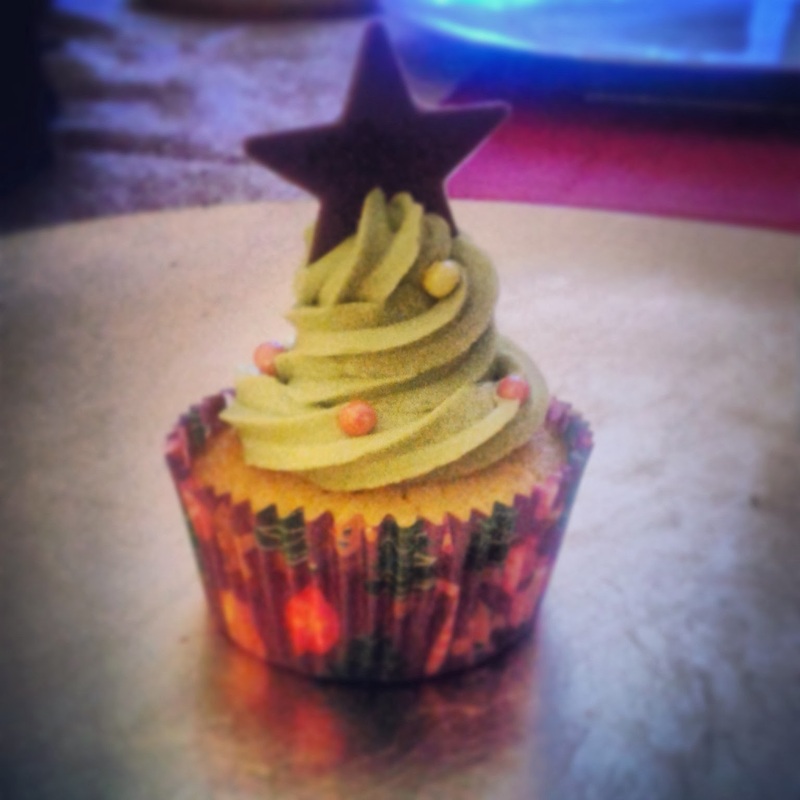 I then decorated each with coloured sugared balls and finished off with a chocolate star on top of the tree. I used a selection of Dr Oetker chocolate stars and also their coloured candy balls. Ready to be bagged up and given to colleagues! Preheat oven to 190c/Fan 170c/Gas 5, then fill a muffin tin with 12 cupcake cases. Once all eggs are added, use a metal spoon and fold in remaining flour. Add the milk and vanilla extract. The mix should have a dropping consistency. Spoon the mix evenly into the 12 cases and put the tray in the oven. Bake for 15-20 minutes until golden in colour and an inserted skewer comes out clean. Add in a teaspoon of vanilla extract if you like. This also loosens the mixture. Add your colouring of choice and mix to combine fully. Spoon the mix into a disposable piping bag, fitted with a nozzle. Make sure cakes are cool, then pipe swirls over each cake, in an upwards movement, to create the tree shape. Make sure you buy unsalted butter, or the cakes will taste odd! If your butter is too hard, grate into a bowl. It makes it easier to cream and soften. Be careful with food colouring – too much can leave an unpleasant aftertaste. Don’t be afraid of store bought decorations. They are a simple way to make your cakes look beautiful. Buy disposable piping bags in bulk online if you pipe a lot. It’s much easier to bin them at the end, than trying to clean them! 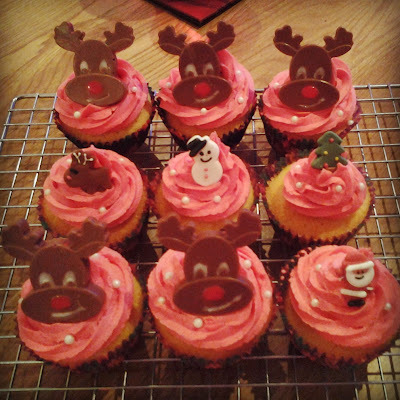 I am entering my cupcakes into Stuart and Kat’s baking challenge Treat Petite this month, hosted by Cakey Boi, with the theme Happy Holidays! Kat will host on alternate months at: The Baking Explorer. Claire, I meant to say thank you for a great entry! Happy New Year and hope to see you soon. Thanks Stuart. Some really great entries last month. Brilliant that so many people are taking part.